Bergen and the Norwegian Fjords – The Great Canadian Travel Co.
Arguably unparalleled in the world for outstanding beauty, the Fjordland in south-west Norway is simply stunning. Enjoy a week on our independent touring program enjoying the very best that the region has to offer. Prices are quoted in US$, per person, based on two people sharing a twin room and one person in a single room and are subject to fluctuation based on the EUR to US$ exchange rates. Arrive in Bergen and transfer to your hotel. Bergen is called ‘the city between seven mountains’ because of the many mountains surrounding it. At 624 metres, Mount Ulriken is the tallest of them. Bergen was one of the major hanseatic cities in Europe and it has been a great centre of trade throughout the ages. Fish was exported from Bergen, while grain was the main import. The first German merchants came to the city already in 1270, and the powerful Hanseatic League existed until 1784, when it was disbanded. The Hanseatic merchants operated in the Bryggen area, which is now included on UNESCO’s World Heritage List. Today, depart from Bergen and set course towards Balestrand by boat. You are going to sail along the fjord of dreams located on the west coast of Norway. Under the arrival at Balestrand you will glands a view of the stunning Kviknes Hotel. This is were you will be staying for the next two nights. A 3 course dinner or buffet will be served at the hotel. Today, you will go on a tour to the Fjærland Fjord & Glaciers. In the morning walk to the pier, next to the hotel, for a cruise along the Fjærland Fjord, which is a 30 km long branch of the Sognefjord. 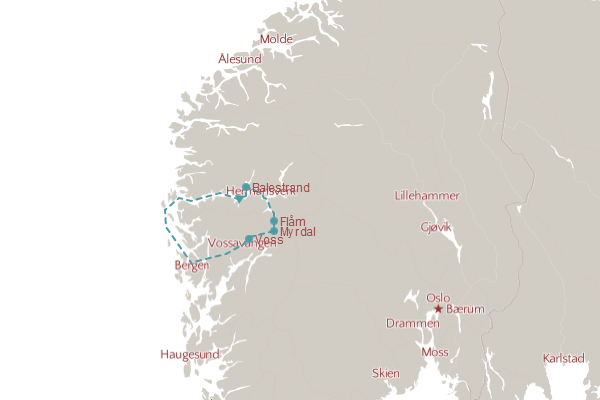 Take the 1½-2 hours boat from Balestrand to Fjærland. Arrive in Fjærland and depart by the glacier bus: First stop is the Norwegian Glacier Museum, which reveals many details about the flowing ice and how it has sculpted the landscape, the fjords and mountains. Also included is a stunning multi-screen presentation on Jostedalsbreen, the largest glacier on the European continent (474 km2). Second and third stop is the Supphellebreen Glacier and the Bøyabreen Glacier: The glaciers – Supphellebreen and Bøyabreen – come down to the valley floor in Fjærland, and they are both branches of Jostedalsbreen. The ice in the ice falls of the glaciers is gliding down the mountain side with a speed of 2 meters per day – among the fastest in Norway. Supphellebreen, at an elevation of 60m, is the lowest lying glacier in Southern Norway. Parts of Fjærland lie within Jostedalsbreen National Park. 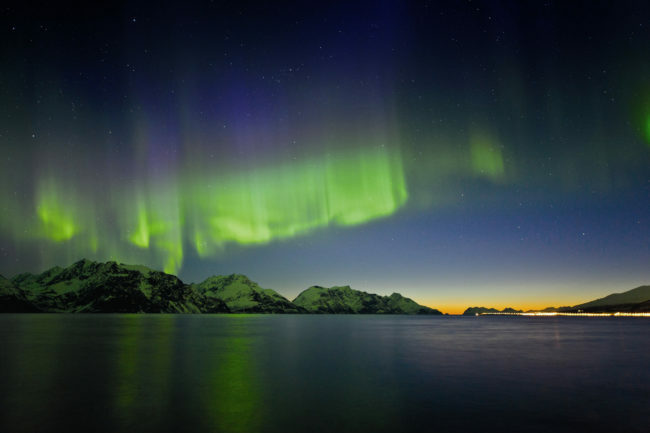 The National Park covers 1230 km² and is characterized by great variation within short distances, from fjords and lowland, to mountains and glaciers. Return to Fjærland and take the boat back to Balestrand. Return to your hotel later afternoon where a 3 course dinner or buffet will be served. This morning you will continue your journey towards Flåm. To get to Flåm you will go on the peaceful tour with the express boat taking you through the Sognefjord and the Auerlandfjord. This unique waterway has several unique arms, and shelter steep mountains and ravines with picturesque villages nestling carefully against the landscape. When earrival in flam you will walk to your hotel Flåmsbrygga Hotel. The rest of the day you have for leisure in. we recommend that you visit the Flåm railway Museum. A 3 course dinner or buffet will be served at the hotel. Today you will return back to Bergen. Board the Flåm train for an exhilarating ride on the amazing Flåm Railway to Myrdal; a masterpiece of engineering ascending 2,838 feet in less than an hour. The ride offers opportunities for photo shoots of exciting waterfalls and mountain scenery. In Myrdal you change for train back to Bergen. Return to Bergen and transfer by private car, back to the hotel. You have the whole day for leisure in Bergen. We would recommend that you take a walk in the harbour and look at The Fish Market and the Market Square. And take a ride to the mountain Fløyen with Fløibanen where there is a spectacular panorama view over Bergen. Fløibanen is a must when you are in Bergen, it has been in use since 1918 and runs with two cars, one blue and one red called blåmann and rødhette. Check out from the hotel, and private transfer from the hotel to Bergen Airport Flesland for your departure home or onward to your next destination. 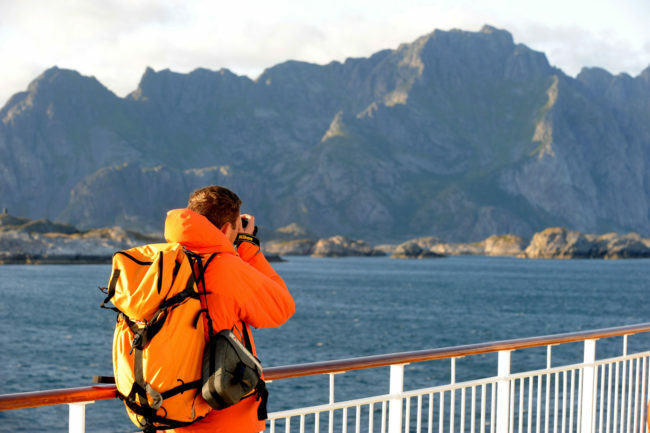 This program is great as a short stand alone tour of the Norwegian fjords or can be added on to a Norwegian Coastal Voyage!